The gasoline lantern’s monotone hissing is machine gunned by the pinging and sizzling of dozens of small flying insects. They are drawn to the light, who knows why, and fry for their efforts. Shadowy bats flight just on the fringe of the light’s aura. A muskrat leaves a wake a few feet from shore. I wonder if it is truly a muskrat or the head of a beaver. It’s too dark to tell. I settle into the eerie coziness of the night, leaning back into the lawn chair set on the bankside. Then the rod tip lurches downward. The strike is heavy, purposeful and sustained. The rod bends deeper and the drag begins chattering as I reach for the rod. As my palm hits the handle, I grasp and reef back on the rod in one fluid action. Pulling the rod out of the security of the rod holder is married with my sinking the hook into the biting fish. The fish is there, heavy and throbbing. The sinking hook triggers a long hard run toward the far reaches of the pool. After quite a battle, the fish is eased over the waiting net. This is channel cat fishing – and I love it! It seems most all the waters around my area host a lot of channel cats. They are in the medium to large rivers. They are in ponds and lakes. The channel cats I catch are from a foot long to 30-inchers. Most are three- to five-pounders. The possibility exists for fish over 10 pounds on virtually any excursion on any water. 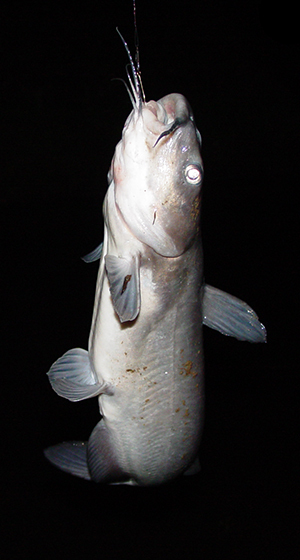 Channel catfish can be caught on most any bait. They hit minnows of all kinds, night crawlers, red worms, cut baits, and a myriad of prepared dough and stink baits. I’ve caught them on all these. I prefer to use live fish as bait. 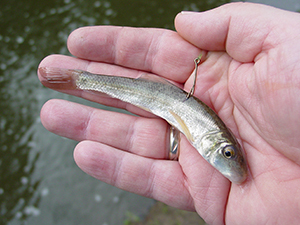 The reason is it seems to minimize a lot of fish you don’t want to catch. By that I mean if you are using a decent-sized shiner, you won’t catch small yellow perch or other panfish. Any type of worm exaggerates the catch rate of panfish and chubs even more. As I’ve gotten older, I don’t seine for bait as much as I used to. If I get a chance to get out, time is usually at a premium and I would rather be fishing than seining. Primarily for this reason, a quick stop at a bait shop allows me to begin fishing as quickly as I can get to the water. Our local shops normally offer fathead minnows (three sizes for panfish, trout and bass). Shiners in different sizes are bought for crappie, bass, pike and walleye. Suckers, at times, can be difficult to find. When they are in the tanks, they can be anywhere from 3” long to maybe 6” or 7”. Normally, it’s the 3” to 5” sizes that are found. These suckers are sold to catch the same fish as the shiners. The largest suckers, if in stock, are usually reserved for pike and musky hunters. Through the years of firsthand catfishing experience, I find that the suckers greatly outproduce the shiners for channel cats. I don’t know why. You’d think either would do the job. I haven’t run any rigid tests on this, but my confidence in a sucker seems well founded. I’ll latch onto more channel cats with a 4” sucker than a 4” shiner. All I can figure is the odor must be different. The cats must like the smell, and taste, of the suckers more than of the shiners. Now is catfishing time. Seek out your favorite catfishing hole and load up with a bucket of suckers. You’ll have fun and catch your share of catfish – maybe even more than your share because of using suckers for bait.